25 Free IPhone Themes + How to! I was surfing the web when I found a cool set of free iPhone Themes to chance the interface off your iPhone. If u are looking for a unique interface just download this Theme pack. 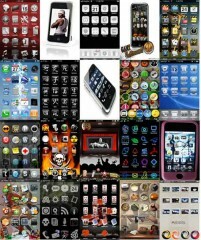 The apple iphone themes set consist 25 themes. U can upload these free themes into SummerBoard iPhone themes directory and activate it. Check below for the How to. » 25 Free IPhone Themes + How to! ToTone is an application for Windows that allows you to create complete themes for the iPhone and iPod Touch. The Application is very simple and easy to use. ToTone covers almost every aspect of theming: wallpaper, icons, the lockscreen, the slider, battery, and all other images. PinoySoul is the name of a new theme which is very similar to iNav.The theme is not yet available in cydia, but check out the preview and comments of the creator after the break. iNav is a new winterboard theme that will soon be released in the ModMyi repository, the theme radically changes your iPhone and iPod looks. The release date of the first iNave winterboard beta will probably be 11.03.2009. Hit the break to see some videos of it in action. FontSwap is a Cydia app thatÂ basicallyÂ takes your iPhone’s/iPod Touch’s Default Font and replaces it with a Font of your choice. The one you see in the picture is called NeoTech. Now the only thing i don’t like about this app is that you can’t preview your font before you chose it, you have to install it, then re-spring ,and then you can see it. Overall i think this is worth getting :) To see how to get it read more inside. Photo inside too.